Authentication on websites and cloud-based services has traditionally involved a trade-off between security and usability. Either the authentication method is easy on users but not very secure, or it's highly secure but difficult on people. For public-facing websites or those with a large consumer audience, finding a way to implement strong security that is easy to use is an even greater challenge. Two-factor authentication methods such as hardware tokens, smart cards and biometrics are too costly and complex for widespread adoption by consumer-facing websites. 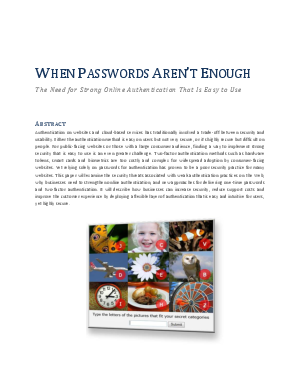 Yet relying solely on passwords for authentication has proven to be a poor security practice for many websites. This paper will examine the security threats associated with weak authentication practices on the Web, why businesses need to strengthen online authentication, and new approaches for delivering one-time passwords and two-factor authentication. It will describe how businesses can increase security, reduce support costs and improve the customer experience by deploying a flexible layer of authentication that is easy and intuitive for users, yet highly secure.